A 'Show Desktop' applet wasn't included in Ubuntu Natty. However, there may be one present in Ubuntu Oneiric by default. Still, you can create a custom one for Natty as well. 6. Open your /home directory. Press Ctrl + H to see the hidden files and navigate to .local/share/applications. 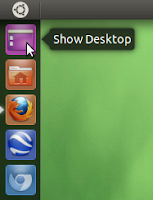 Drag and drop the "showdesktop.desktop" file you see there to the Unity Launcher and you are done. When you click the icon, it starts blinking and might not respond to clicks for the next 10 sec or so unless the blinking stops. In that duration, you can use middle-click and force it to respond immediately.